This is one version of the harm reduction outreach worker’s explanation for the value of tuning into the natural world while learning how to help other with addiction. 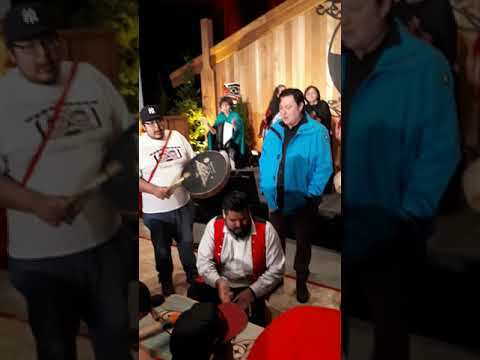 His other explanation describes the empowering and grounding experience a Nuu-chah-nulth person can find by drawing upon ancestral ties to their territory. “When we show our masks, when we sing our songs, when we use our rattle we are collapsing time and invoking the ancestors to join us,” said McCarthy. In the final stage of a three-week intensive harm reduction course through the Nuu-chah-nulth Tribal Council’s Teechuktl Mental Health department, McCarthy took his students to the shore of Long Lake in Nanaimo to once again attune to the inherent wisdom in the water. Running over three separate sessions from November to late January, this training is aimed to prepare representatives from each of the NTC’s 14 member nations to deal with addictions issues in their respective communities. Across the province drug addiction has gripped B.C. in an escalating crisis – largely due to the lethal presence of the opioid fentanyl in illicit street purchases. The B.C. Coroners Services’ most recent statistics show an eight per cent increase in suspected drug overdose deaths in December compared to the same month in 2017 – amounting to an average of four per day. This wave of tragedies has continued since 2014, over which period suspected overdose deaths rose from under 400 to almost 1,500 in 2018, far surpassing suicides, motor vehicle incidents and homicides as the leading cause of unnatural death in British Columbia. Eighty per cent of the suspected overdose victims were men. Gail K. Gus has seen the prevalence of drug addiction spread in her community during her 20 years of working for the Tseshaht First Nation. To better equip Nuu-chah-nulth communities for overdose emergencies the harm reduction training included lessons in administering life-saving Naloxone injections – but the education focused on the value of building relationships with clients through traditional cultural practices. Natalie Ocean, another harm reduction outreach worker with Teechuktl, said this is fundamental to the harm reduction approach to addictions treatment. Across the river from the Tseshaht reserve lies Port Alberni, a small city that has faced more than its fair share of issues tied to the opioid crisis. Sudden increases in overdoses prompted Island Health to issue two advisories in 2018. Those working on the front lines of the crisis say a hit of crack costs as little as $5. In May 2017 a supervised injection site opened at 3699 3rd Avenue, and since that time has seen over 21,000 client visits, averaging more than 35 a day during the facility’s operating hours of 8 a.m.-4 p.m. This activity has sparked concerns from neighbours and local businesses, but on Feb. 4 Island Health announced the renewal of its contract with the safe injection site’s operator, the Port Alberni Shelter Society, noting that congregation in and around the site will be discouraged. As has been the case in safe injection sites across B.C., no overdose deaths have occurred at the Port Alberni location. With the exception of two to three suspected overdoses in Ucluelet last year, Ocean has seen the overdose crisis mostly affect those living in Port Alberni, Nanaimo and Victoria.